Anterior Lumbar Interbody Fusion (ALIF): fusion procedure where spine is accessed through patient’s abdomen. Anterior lumbar interbody fusion (ALIF) is a type of spinal fusion which involves an anterior approach to fuse lumbar spine vertebrae (bones) together. Anterior refers to the front of the body. Lumbar means the last five vertebrae of the spinal column. Interbody refers to the space between the vertebrae to maintain and reestablish disc height. Interbody spaces may have material inserted to help promote fusion. Fusion means to surgically induce a union or joining of bone. ALIF is usually performed to treat a variety of painful spinal disorders, including painful conditions like Degenerative Disc Disease and Spondylolisthesis. ALIF is preferred when there is a need to fuse multiple spinal levels and remove multiple discs. How is anterior lumbar interbody fusion (ALIF) performed? Patients are given a general anesthesia and preoperative intravenous antibiotics. They are then laid on their backs on a radiolucent operating table. A 3-to 8-centimeter incision is made just to the left of belly button. Abdominal muscles and intestines are moved aside. The damaged intervertebral disc is removed, and some of the disc wall is left behind to help contain the bone graft. Special distractor instruments are used to restore the normal height of the disc and to determine the appropriate size of bone graft. 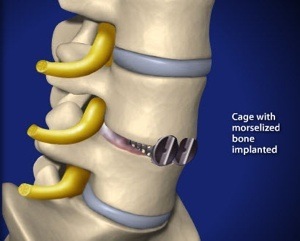 A metal cage filled with bone graft is carefully implanted in the empty disc space. 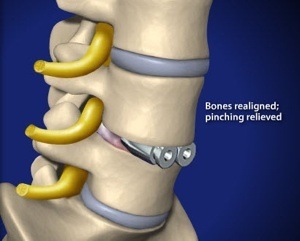 This realigns the vertebrae and removes the pressure from pinched nerve roots. Fluoroscopic X-rays are taken to confirm the graft is in the right place. Usually the procedure will be sufficient to secure the vertebrae, but if additional support is required for the spine, surgeons may decide to use a series of screws and rods for support during the healing process. This will connect the above and below vertebrae. Over time, the bone graft will grow through and around the implant. The intestines and other blood vessels are put back in place, and the wound area is washed out with sterile antibiotics. The procedure ends when the skin is sewn or glued together. The patients are allowed to bend, twist and to lift weight after 4 to 6 weeks of surgery. By this time the pain subsides and the back muscles get stronger. What are the potential complications and risk factors?